Seeds of Change: In the Best Interest of the Child is the theme for a series of on-demand workshops on social work, building self-esteem and child development, targeted to educators, counselors, and other childcare providers, with the goal of providing practical skills for successful living. The workshops are conducted by member organizations of the VA NGO Network for their local partners, staff and volunteers. Develop a vision for advancing the field: What work is needed to refine and advance the field and its practice areas for social network and collaboration to promote the emotional health of children. Staff/volunteers of NGOs and grass root organizations working in rural communities; school personnel and all personnel involved with education projects. Staff/Volunteers who want to sharpen their skills on how to present or talk to others and/or the media about their work and their nonprofit organizations. Members: 2 complimentary admissions, $15 per additional participant. Space is limited on a first-come, first–serve basis. Registration fee includes all training materials, lunches, and refreshments. Pre-Registration is required. Interested participants are required to confirm their attendance by completing the online Registration Form before March 1, 2014. Music is a lens through which we can visit another time or place. Music can tell us about the people and society of a particular time. Traditional music especially spans many generations and reflects the traditions and customs from many different regions. Vanessa Vân-Ánh Võ, Vietnamese national champion, Emmy Award winner, Oscar nominee, composer, vocalist, and educator, will use traditional music to showcase Vietnam’s 4000-year-old cultural heritage. The sounds of the traditional instruments and folk songs will offer insights into the different traditions and customs of Vietnam’s three main regions-North, Central, and South. 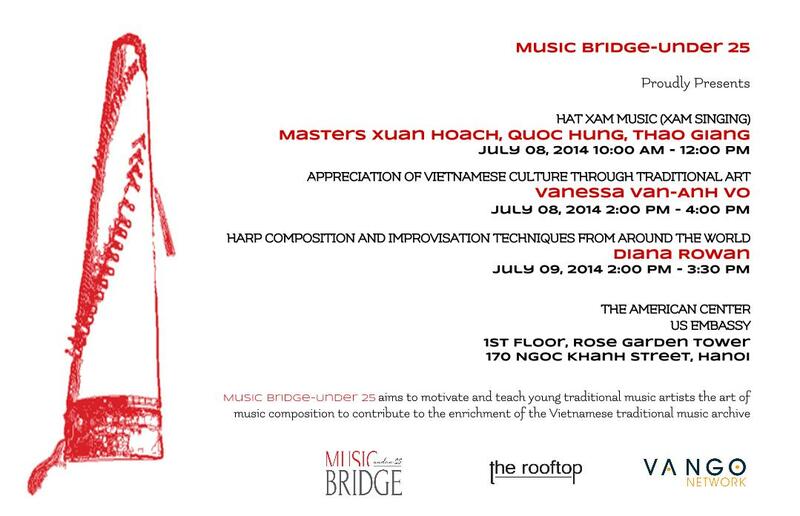 Under her guidance, the audience will join Vanessa Vân-Ánh in playing some traditional instruments to create their own music. This hands-on experience will help the audience appreciate and understand more about the Vietnamese cultural history and traditions. As one of the oldest instruments still existing, harps are represented all over the world in many forms, such as the dan Tranh of Vietnam. Each culture approaches harp composition and improvisation in its own unique way. Many of these techniques are especially powerful as they spring from the harp itself rather than being influenced by other instruments such as the keyboard. This is a very practical lecture-demonstration-workshop, focusing on how to incorporate these techniques into your own harp arranging and composition. Non-harpists and even non-musicians will also find this workshop interesting from historical and aesthetic viewpoints. Feel free to bring your instrument! The VA NGO Network Health Education Initiative (HEI) PedFACTS-Vietnam is collaboration between Project Vietnam Foundation, American Academy of Pediatrics and VANGO Network focusing to provide the Pediatric First Aid Training for caregivers and teachers based on PedFACTS for which the American Academy of Pediatrics (AAP) has granted Vietnamese copyrights to Project Vietnam Foundation (PVNF). Participants will receive the Instructor or Provider Certificate American Academy of Pediatrics AAP & the VA NGO Network provided they have successfully completed the course. Registration costs covered course supplies, training materials, book and certification from American Academy of Pediatrics & the VA NGO Network. Pre-Registration is required. Space is limited on a first-come, first–serve basis. The strength of many, the heart of One.